When wintry weather settles in at the canyon, and the world-famous gorge is filled with clouds, it can be a real challenge to meet the expectations of the average visitor. 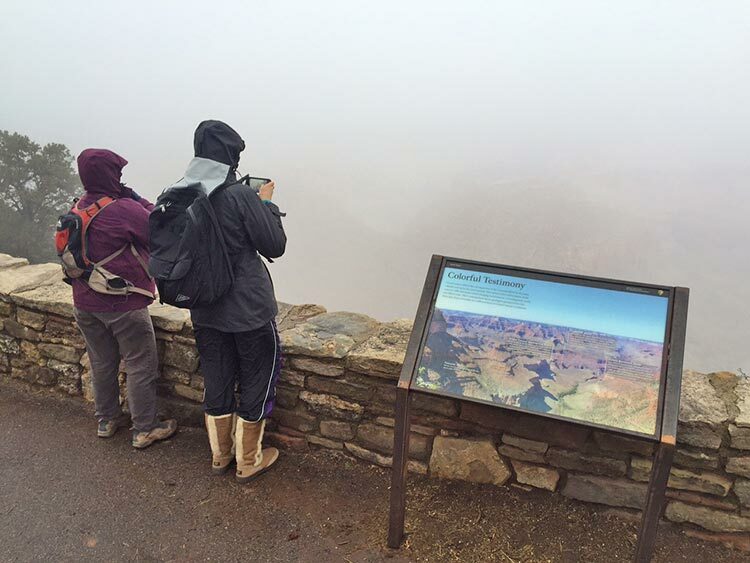 No platitudes offered by the locals can soften the disappointment of a family that has traveled across the state, country, or globe to see the Grand Canyon, only to be greeted by unrelenting fog and mist completely obscuring the view. I recall once encountering an elderly woman from Sao Paulo, Brazil, who had stood motionless for hours, waiting for her chance on such a day. I happened upon her just as the clouds separated for a few precious moments, unveiling a brilliantly-lit chasm below. The fog closed as quickly as it had parted, but the sight was enough to reduce her to joyful tears. Desert View Watchtower at the East Entrance of the park. This architectural marvel constructed in 1932 has a plethora of Native American paintings on the interior walls. The structure’s main tower also features a spiral staircase to its uppermost floors. Once you reach the top, you’ll be at the highest point on the entire South Rim. The History Room in the Bright Angel Lodge. An homage to Grand Canyon’s pioneer history, the props and interpretive panels in this mini-museum describe a quirkier side to Grand Canyon. Exhibits include the intriguing story of the Harvey Girls, the refined young women hired by the Fred Harvey Company in the early decades of the 2oth Century to provide impeccable service in the hotels and dining halls along the rail lines of the American West. Kolb Studio near the Bright Angel Trailhead. The former home and studio of the famed photographers Emery and Ellsworth Kolb affords some of the most dramatic views of the canyon from any park structure. Visitors can spend hours booknooking in the gift shop, immersed in the human history exhibits, or gazing at art. The gallery on the lower floor offers a free exhibit that chronicles the Kolb family’s sixty-plus year history at the canyon, including the brother’s many exploits. From mid-September through the winter holidays, an exhibit of selected paintings from the Celebration of Art (a plein air painting festival that occurs each fall) are on display for viewing and purchase. Mather Point Visitor Center. The state-of-the-art interpretive exhibits and free, 20-minute orientation film at the main National Park Service visitor center are worth seeing in any weather. Everyone from rangers to gift shop staff will be happy to help you plan your day as well, to ensure that you have the best possible time at Grand Canyon National Park.